UND President Mark Kennedy makes is way up and down the aisles of the rolling UND “Leaders in Action” bus during a recent tour across the southern part of North Dakota. Kennedy and First Lady Debbie Kennedy host the trip every year for new faculty and administrators so they can get to know their new home state. Photo by Peter Johnson/UND Today. A fourth-generation farmer in Carrington, N.D., he scanned the crowd, eager to flaunt the machinery. Amy Whitney, UND’s new director for the Center for Innovation, raised her voice as others hesitated. She quickly clambered up the deck. Harmon followed her to guide the ignition. “The cabin was actually very roomy,” said Whitney, about the experience, which took her back to her childhood on a dairy farm in Vermont. In moments, the engine roared, the reel rolled and the auger rocked. North Dakota’s agricultural lore came to life. 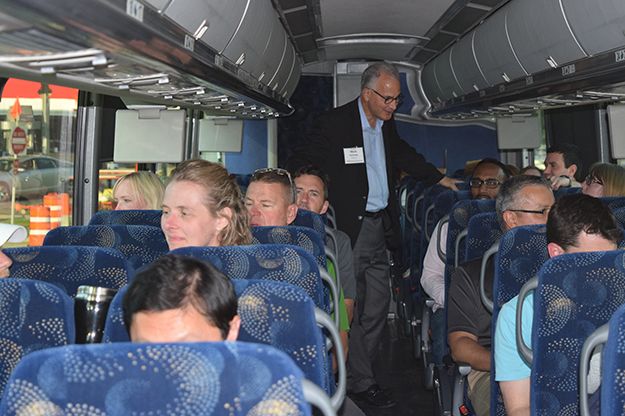 As fine dust surged, the new UND employees received an early peek at what was ahead on their three-day bus tour across southern North Dakota. 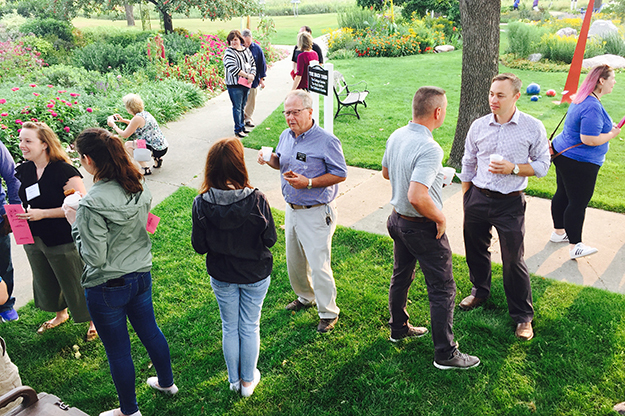 UND newest faculty members and administrators visit with residents of the Mayville, N.D., in the city’s beautiful community Rainbow Garden and Sculpture Walk. It was the first stop on this year’s annual New Faculty and Administrators Bus Tour across the state. Photo by Peter Johnson/UND Today. In its 28th annual installment, the jaunt introduces UND’s new family to one another, the state, its people and their livelihood. This year, UND newcomers are from all corners of the United States, including the territory of Guam. The nations of Ghana and Bulgaria also were represented on the trip, hosted by UND President Mark Kennedy and First Lady Debbie Kennedy. 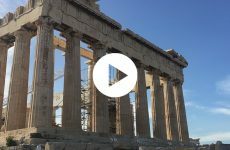 “UND’s annual tradition of taking new faculty and staff to see our beautiful state is vital in terms of helping our team connect with students with a better understanding of the state from which many come,” said President Kennedy. “It is also important for the state to understand that UND is focused on generating opportunities for the state and its students. So many we met during the tour thanked us for coming. From the first stop, a coffee break at Rainbow Gardens in Mayville, where newly installed Mayville State University President Brian Van Horn and local leaders greeted the still sleepy group, the dictum of “North Dakota nice” shone through. Later, at his farm, Harmon truly embodied it. “It is part of North Dakota’s hospitality,” he said. “That was the way I was brought up and that is the way Maria, my wife, is and our kids are. 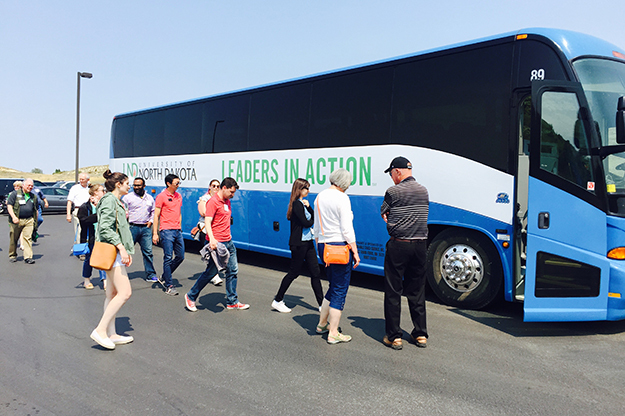 Along the way, resident experts, such as Chris Griffin, a former Grand Forks-area legislator, attorney and agricultural analyst, gave live on-bus window tours of the state’s economic drivers in action. Griffin focused on the history and importance of agriculture in the state by pointing out various crops in the passing fields. Brian Kalk, who served on the North Dakota Public Service Commission and now is a director at UND’s Energy & Environmental Research Center, did the same for the state’s natural resources and energy legacy. 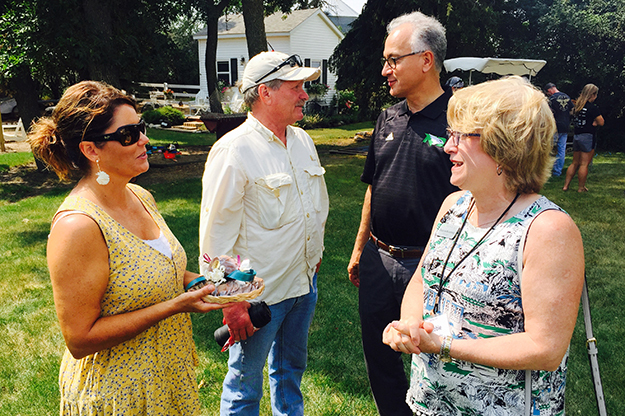 Maria and Jim Harmon visit with UND President Mark Kennedy and First Lady Debbie Kennedy, during a recent visit to the Harmon farm near Carrington, N.D. The Harmon family have a strong and proud UND legacy. Photo by Peter Johnson/UND Today. After lunch at the Harmon farm, the tour participants ventured farther west to the Falkirk coal mine near Underwood, N.D., where they scaled a massive dragline – used to move tons of heavy North Dakota soil in one fell swoop. The group clung to the railings of narrow story-high platforms as the excavator dug out soil with a bucket large enough to carry a small home. The giant machine was operated by a single man in a tiny control room at the front. Later in the trip, some 250 miles away from the mine, another signature North Dakota operation flung its door open for UND. The Bobcat plant in Gwinner made for an hour-long, two-mile jog around precision robots and workers as they produced and assembled hundreds of parts for the brand’s hallmark lines of compact equipment and loaders. At both the Falkirk mine and the Bobcat facility, UND has etched its mark with adept alumni at top positions as well as current students with rigorous internships. 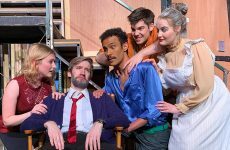 “It was interesting to learn how many [UND] alumni have stayed in the state and made such a big impact on [its] development,” said Camilla Morrison, costume designer and theatre arts instructor. 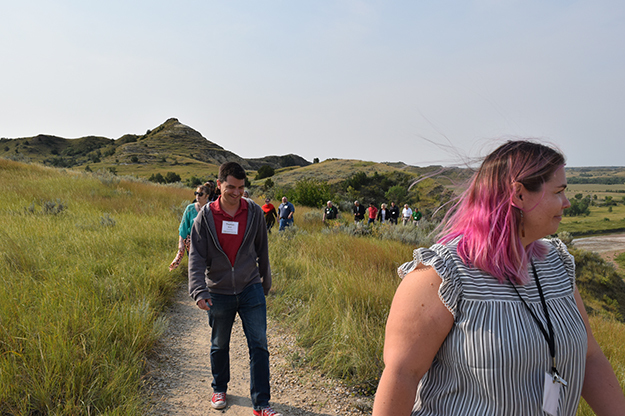 Camilla Morrison, director of costumes for UND Theatre Arts; and Thomas Motl, assitant professor of counseling at UND, head of the pack as the crew of new faculty and administrators venture in Theodore Roosevelt National Park. Photo by Dimitria Williams/UND Today. The tour did not solely focus on North Dakota’s industrial capabilities and the University’s role in enhancing them. It also showed a more relaxed aspect of the state that lures outsiders — its wilderness. When it comes to nature, Theodore Roosevelt National Park and the city of Medora basked with all the wonder the Badlands could harbor. The park, with its ragged hills over the Little Missouri River, posed for postcard-perfect photos as tour partakers hiked a trail under the guidance of National Park Ranger Aubrey Davis. “As we travelled west and the landscape changed, it was really surreal,” said Chester Fritz librarian Heather Rogers, a native of Long Island in New York. Bus driver Gerry Eggers (right) oversees a group of new UND faculty and administrators board his bus on one of the tour stops around North Dakota. Photo by Peter Johnson/UND Today. After a dive into the three major aspects of North Dakota’s economy — agriculture, energy and tourism — the tour shifted toward education. Just outside the capital city of Bismarck, a visit to United Tribes Technical College, an institution governed by the state’s Five Affiliated Tribes, revealed the school’s positive sway in the sometimes troubled lives of American Indian students. The complex but crucial narrative of the place, as a vestige of skirmishes and harbinger of change, also came through. “It was just fascinating to me,” said Craig Burns, assistant professor of social work. “I was very impressed with the history and the support that they provide to the students. “[T]hey have just started a two-year social services program, which in a lot of places can be a gateway to social work education. Amy Henley, UND’s news Business & Public Administration dean, drew ideas from another site — the State Capitol, which also hosted tour members. From the two legislative chambers to the judicial wing, the skyscraper-type building brims with references to North Dakota’s progress and values. Many reflect in the Art Deco aesthetic of the edifice, which presented Henley with cues for the design of a proposed new campus headquarters for her college. For others, the capitol showcased a peculiar feature of North Dakota’s government: the ease of communicating and collaborating with state officials. In an impromptu arrangement, faculty and staff met with North Dakota Attorney General Wayne Stenehjem and State Sen. Ray Holmberg, R-Grand Forks, both UND alumni. The UND group also greeted North Dakota Supreme Court Chief Justice Gerald VandeWalle, with a boisterous rendition of “Happy Birthday” in the capitol’s Great Hall on the 85th anniversary of the UND alum’s birth. “I was particularly struck by how many members of the state legislature and the political system are UND graduates,” said Thomas Motl, assistant professor of counseling psychology and community services. 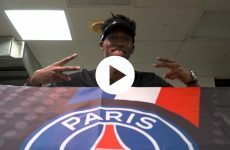 “It does give you a sense that we are pretty closely connected as faculty to the people who make a lot of the big decisions for the state,” he added. There also were opportunities for tour participants to connect with other University alumni as well as future UND students. These included a reception at the Heritage Center in Bismarck, attended by the four UND-grad Supreme Court justices, among others, and a dinner with incoming National Merit and Presidential Scholars at Fort Lincoln State Park near Mandan, N.D.